The good news is that I can talk about the events of the previous issue of Marvel’s Civil War II with full spoilers this week, the less good news is that Civil War II #4 itself has returned to the pattern of alternating between action-packed plot driving issues and low-key reaction issues. In case you hadn’t guessed, Issue #4 is the latter. While it’s undoubtedly an important aspect of the story, the slower build issues like these are much stronger when you’re able to read them in combination with what comes before and after. Waiting at least a week between issues means Civil War II #4 (like Issue #2 before it) doesn’t pack the same punch as their odd-numbered counterparts and the cliffhangers lean more toward the “the next one should be good” reaction rather than any emotionally charged “Holy crap I need to know what happens next!” buzz. For a more outright positive review, the Civil War: Choosing Sides comic is well worth a look again with an unusually humanising J. Jonah Jameson story (feat. 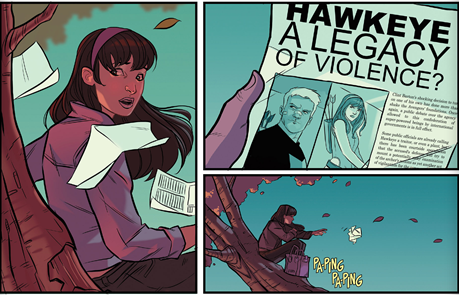 Silk) and a genuinely great insight into Kate Bishop‘s Hawkeye (feat. the always excellent Young Avengers) trying to cope with the events of Civil War II. Speaking of which, remember how Marquez got to make Clint Barton cry beautiful tears last issue? That was because Hawkeye has just been catapulted into comic-book legend by straight up murdering the Hulk. The feat wasn’t actually as impressive to readers as it would be to the in-universe population that are understandably blown away by the sudden news, and while Bruce Banner and the original Hulk are dead, Amadeus Cho is still Hulking out in his own comic and the occasional Civil War II: Gods of War appearance. 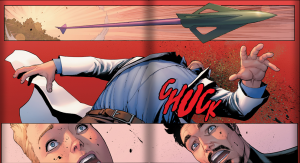 With that said, the death of Bruce Banner, one of the original Marvel characters and one of the rare few that was an Avenger before Steve Rogers, is without a doubt a huge turning-point that (no offense to Warmachine) genuinely raises the stakes of the entire Civil War II event. The circumstances surrounding the slaying of Bruce Banner were well weighted enough to give some realistic room for disagreement in the legal and superhero communities and with such a public event bringing things to a head we’ve finally reached the breaking point in the “should we act to prevent future crimes” moral schism. Poor She-Hulk has finally come out of her coma just in time to hear that her cousin is dead (and that the world is effectively celebrating) and Captain Marvel is upholding the law with the best intentions as her stance becomes less and less defensible. 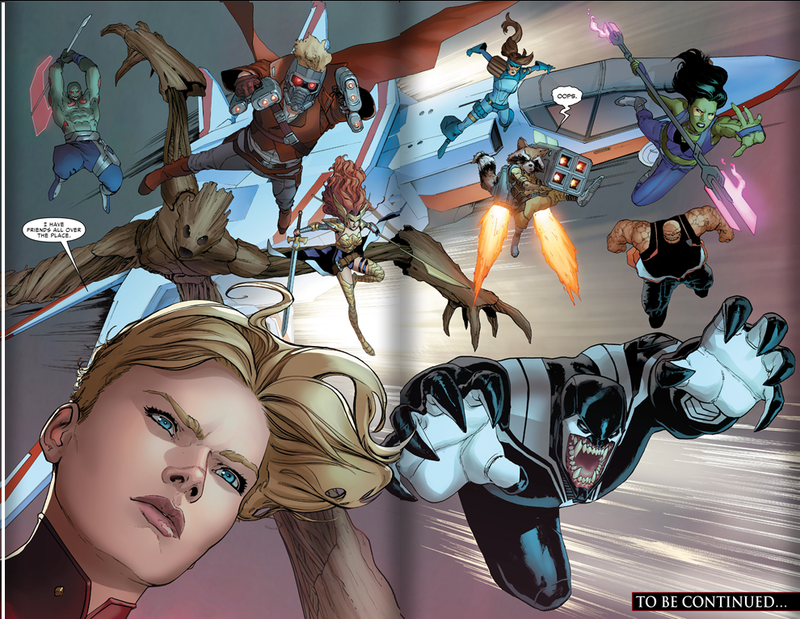 Despite personally liking Carol Danvers much more than Tony Stark, I’m finding it far too easy to side with Team Iron Man this time around. Of course the big moment for this issue came in the last few pages when the teams formed up for the first time, a moment that was partially robbed of its big impact by the announcements of who would be on which side in the promotional build up to the event months ago, but on closer inspection the sides that were announced aren’t accurate (at least, not yet). 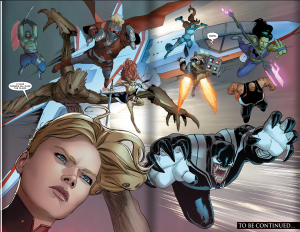 In this initial confrontation the biggest names are definitely standing with Tony and I can’t see how any amount of justification from Carol will convince She-Hulk not to join him too, but at the very least Captain Marvel can count on her friends from outer-space to help even the odds, guaranteeing Civil War II: Issue #5 will kick off with a bang.